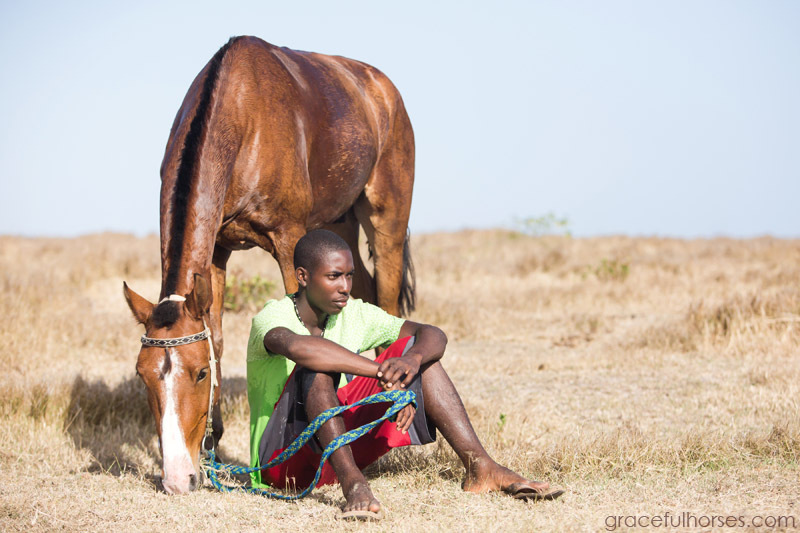 My photography work brought me to St Lucia early this year and I used the opportunity to tap into the local equine world. To my delight, I found a place of great beauty and authenticity: the Atlantic Shores Riding Stables. 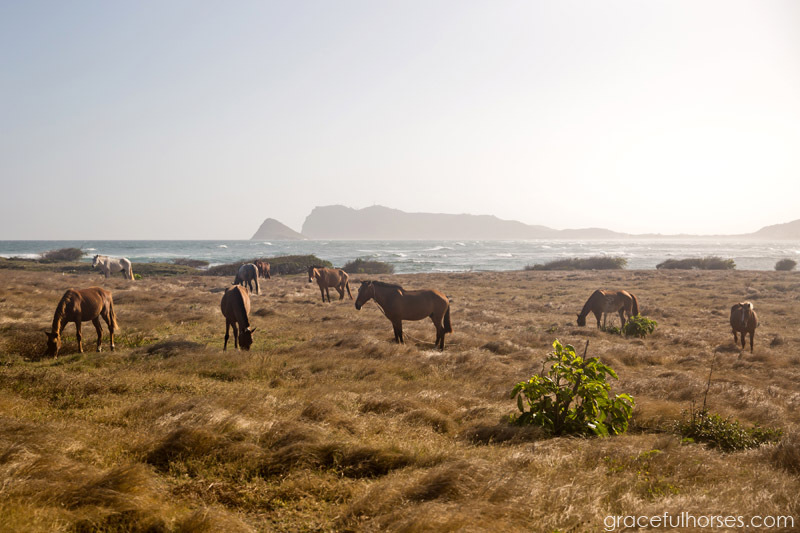 A few elements distinguish this horseback riding operation from others: its breathtaking, off-the-beaten-path location, the amount of land the horses freely roam on and the owners’ commitment to their well being. 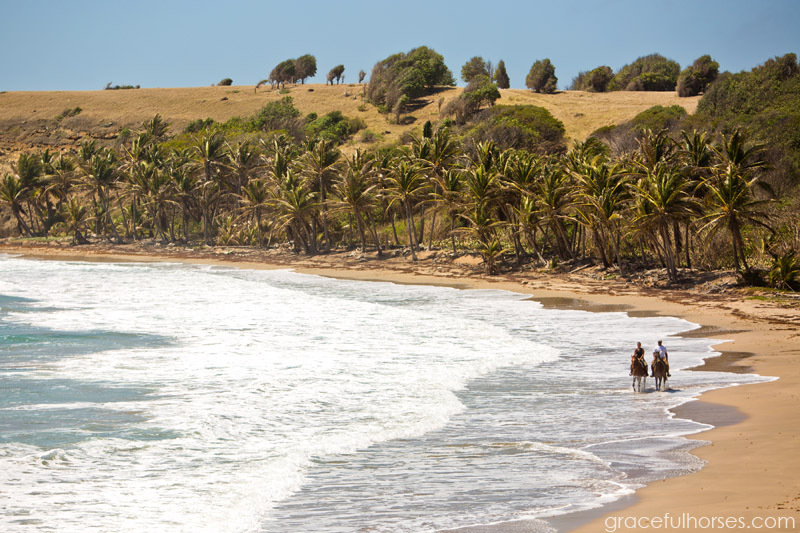 The Atlantic Shores Riding Stables are located on the South side of the island, near Vieux-Fort, an area currently less developed than the North. 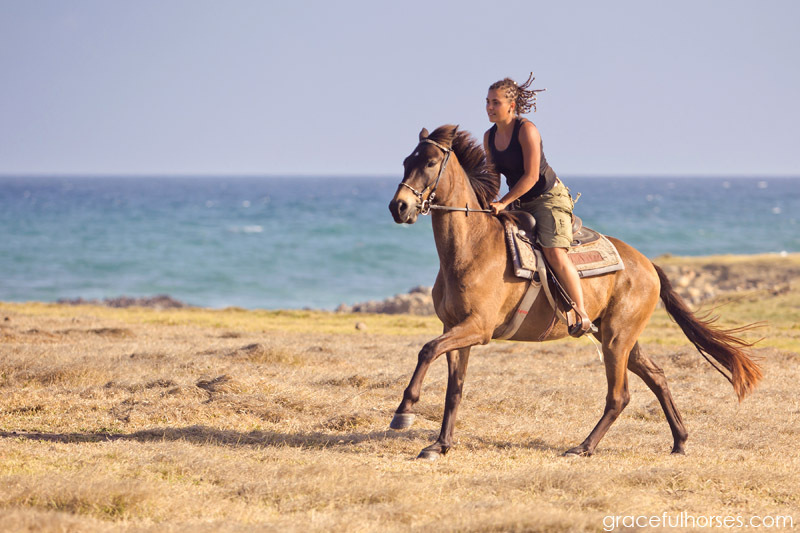 Their riding trails meander on a vast, spectacular piece of private land with breathtaking views of the Atlantic ocean. Standing on the edge of the shoreline and looking down at the waves crashing against its rocks is an experience which remains engraved into the soul. Melanie Shufaisl, Swiss farrier and Atlantic Shores friend, with horse Outlaw: a dynamic duo! “We always chuckle whenever our guests anxiously ride through the wooded areas, wondering if we will also take them to the ocean. And then, when they least expect it, the trail opens in front of their eyes and they see it – the beautiful Atlantic coastline, leaving them in total awe of this magical place”. 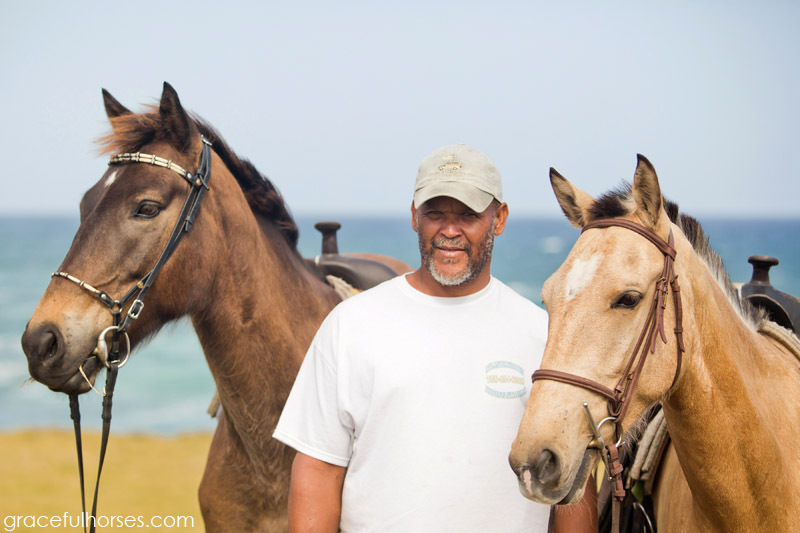 My main point of contact at the Atlantic Shores Riding Stables has been an admirable man: Wayne Imbert, one of the three owners. 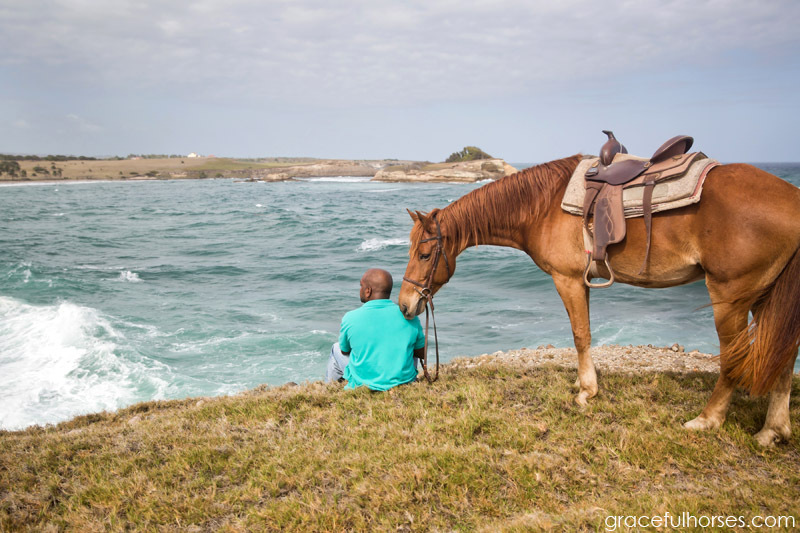 Wayne’s passion, enthusiasm, desire to share the beauty of his island and his love for the horses were the deciding factors and a confirmation that I was going to the right place. Wayne has ridden horses since his early teenage years. He met one of his current partners and admirable horseman, Max Dalphinis, while racing for him at the time. “Max is a gentle soul and he is totally against using whips on his horses, so that caught my attention at a very young age. I knew right then how special the horses were to him”, recalls Wayne. The idea of the riding stables was born in 2003, when Wayne crossed paths again with Max. “We decided to start our own riding stable and be the first in Vieux-Fort to have a facility everyone could be proud of. We wanted to showcase our South and do something we both were very passionate about”, says Wayne. Even before meeting Max during my visit, I was already intrigued with Wayne’s soulful description of him. Max is a special human being whose gentle eyes read straight into your soul. He has a natural, caring and respectful way with the horses and they reciprocate the love and kindness. Max takes great pride in sharing the beauty of the land and visitors fall in love with the trails because of the freedom they experience while riding. Wayne’s childhood friend, Rhon Stephens, joined in and took over the business side of the operation, ensuring everything runs smoothly. The three friends are now a tight team with one common goal in mind: to offer their guests the ultimate adventure. 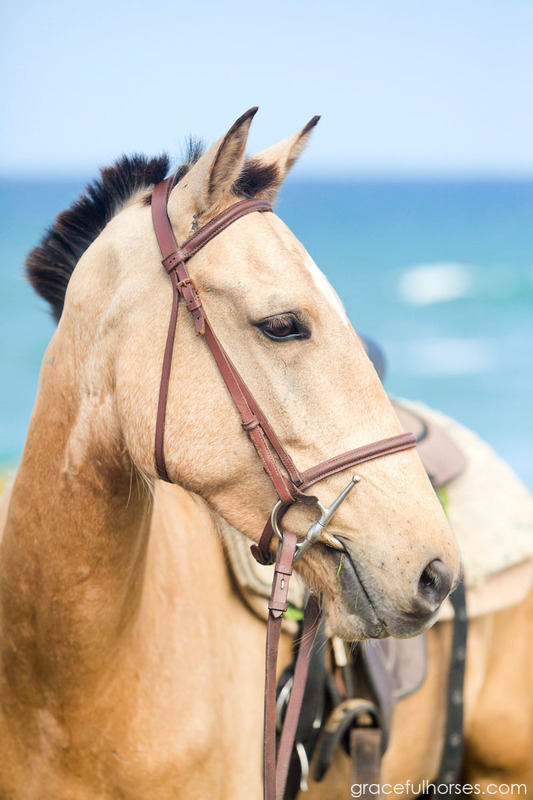 The Atlantic Shores horses are a mix of Arabs, Thoroughbreds, Quarter horses and smaller local breeds, which makes them very well adapted to the terrain. These animals are supple, agile, well trained and mannered, making them a delight to ride and be around. “We provide them with everything they need to be happy and healthy. We are not a rescue organization but we have purchased horses that were pretty much skin and bones and provided them with a loving home where they could roam free and be horses again”, says Wayne. 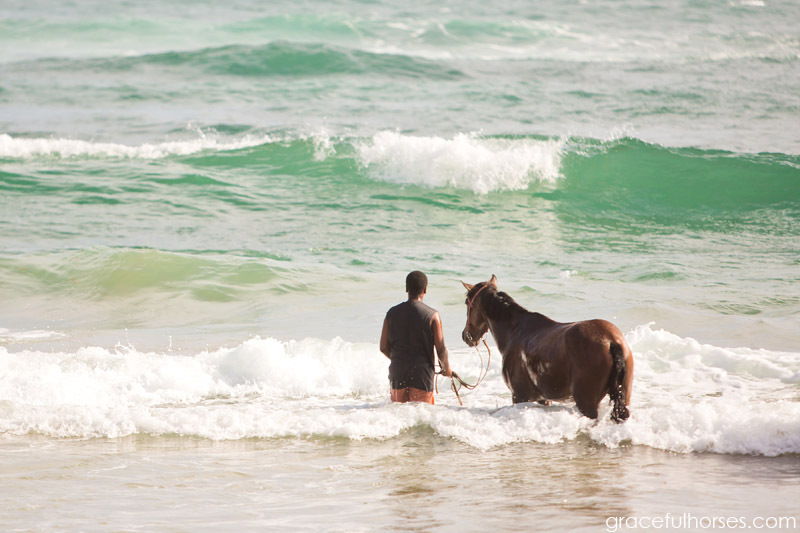 The horses are spirited and playful and watching them take a bath in the ocean is quite a spectacle. I have never seen horses have so much fun whenever a big wave splashed against them! They would completely disappear in the warm water for a couple of seconds and come right back up, shaking their beautiful bodies to rid of salty drops. Marvin and horse Bingo love their afternoon bath! The stables employ a few young handlers who are very connected to the horses. 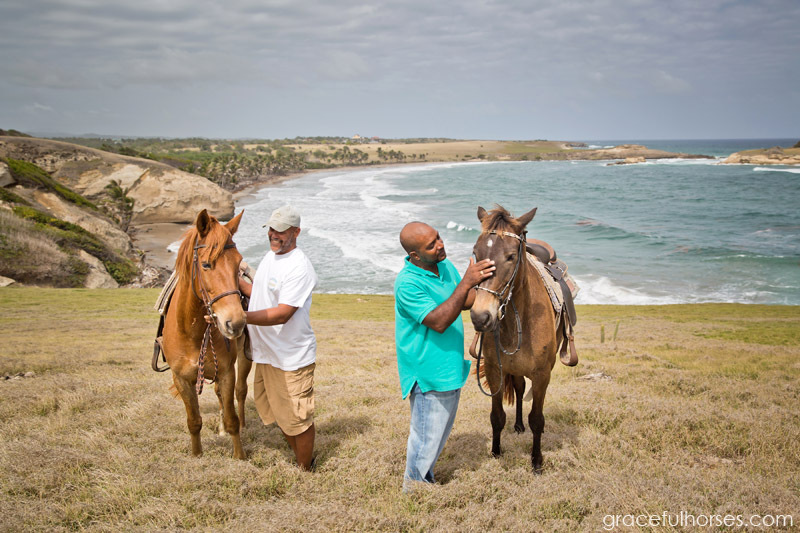 “A lot of kids here in Vieux-Fort own a horse and love riding on the beach. We wanted to have a business that could employ some of them after they left high school. It’s hard to get a job here after graduation, so we wanted to offer them the opportunity to learn the trade of the business. It introduces them to the tourism product and hopefully one day they can start their own businesses” (Wayne L.). After having been the main farrier for a while, Max has passed his skills on to a few of the young handlers and they are now the ones shoeing the horses when needed. They provide this service to other horse owners on the island and everybody wins. “Our goal is to provide a safe, fun and memorable riding adventure in St. Lucia. We want our guests to visit us and have the time of their lives. We love what we do and we love showing our trails. 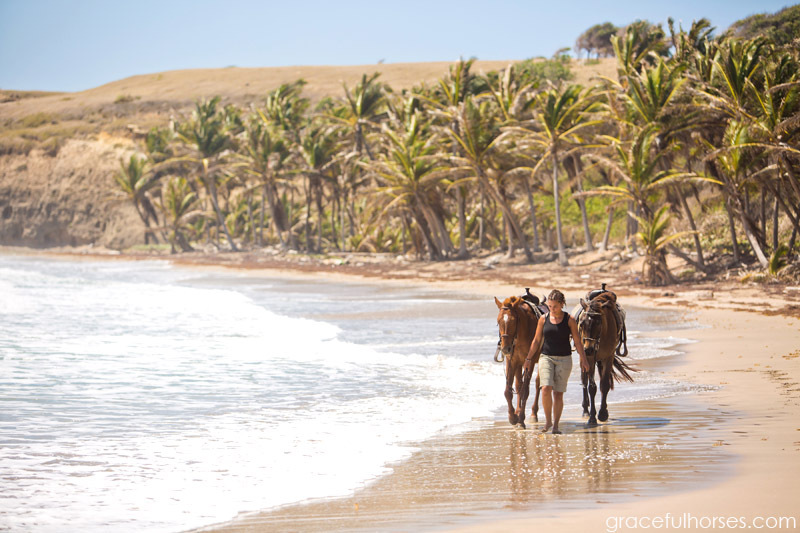 Horseback riding on a tropical beach is high on the bucket list of many travelers. We want our guests to leave here completely satisfied and exhilarated after touring with us”, says Wayne. Aside from unparalleled trail riding and (soon to come) sunset rides, there are plans for a jumping arena and classes in horsemanship, nutrition and hoof care. Visit the Atlantic Shores Riding Stables’ website and book your riding adventure first time you are on St Lucia. You will be delighted!